on 06 November 2015 . Drilling cuttings solidification unit is one of the solution of cuttings disposal, it is also called stabilization unit. It is an effective solution for both water based cuttings disposal and oil based/ synthetic based cuttings disposal. Obviously, The waste cuttings will damage the environment, lead a heavy pollution and contaminate the under groundwater and influence the Sustainable Development. GN solids control is specialist for the mechanical separation of drilling cuttings. GNCM-40A & GNCM-40B is our standard drilling waste management system for oil based drilling cuttings, especially for international client, it is design suitable for container shipment. The main difference between them is the installation of the decanter centrifuge, the centrifuge is installed on the telescopic skid in proposal A, the centrifuge is installed on the catch tank on proposal B, they are 2 main methods in the existing projects. The modular drilling waste management unit including high-G drying shaker unit and decanter centrifuge telescopic skid unit are the main equipments for water based cuttings treatment. 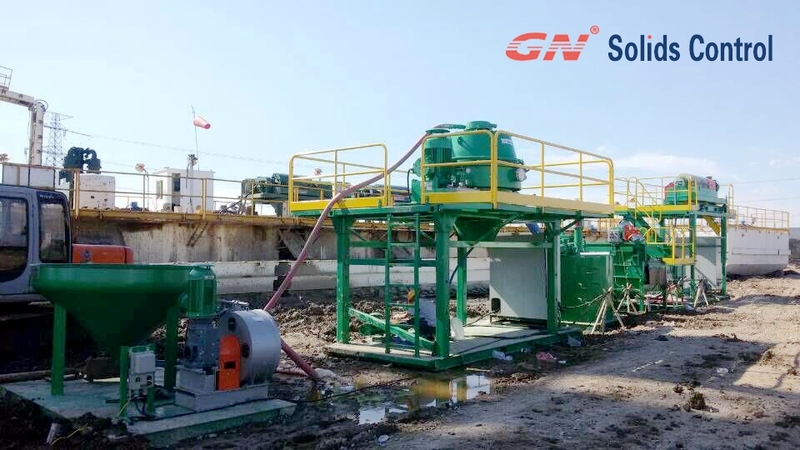 After treated by GN drilling waste management unit, solidification unit will be used for water based mud, and thermal desorption unit will be used for OBM and SOBM. The OOC in the discharged dry cuttings from the vertical cuttings dryer is under 5%, sometimes it reach 3.7%, in some countries, it is acceptable for environmental standard for land filling. In some counties where has more strict environment standard for the cuttings disposal, a further equipments TDU is necessary. GN Solids Control, as TOP solids control manufacturer in China, has been the equipment supplier of the oil service companies for many years.Usually, in order to provide a better after sales service, GN Solids Control sends a checklist for customer to fulfill. To get more info of our Thermal desorption unit and solidification unit, pls contact with GN solids America. Drilling cuttings solidification unit is one of the solution of cuttings disposal, it is also called stabilization unit. It is an effective solution for both water based cuttings disposal and oil based/ synthetic based cuttings disposal. To get more info of our Thermal desorption unit and solidification unit, pls contact with GN solids America.